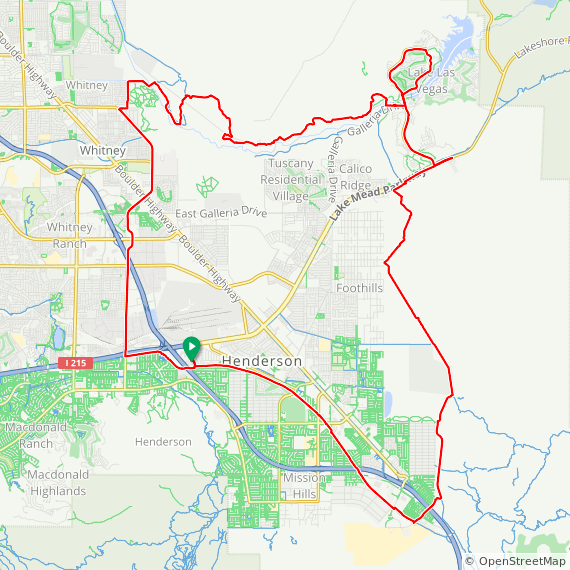 For our first Henderson ride of this season, we'll spend much of the day on some of the area's excellent paved pathways. And when I say "pathway," don't think it's all flat and easy -- there are a couple of "interesting" climbs on today's route. We start with a few miles of very gentle climbing on the Union Pacific Railroad Trail, which gains about 400 feet of elevation on its way to the edge of Henderson. Then we'll make a quick connection under 515/95/93 to join the River Mountains Trail, and we'll conquer the Sisters, a series of short but moderately steep hills, but in the easier direction. We'll take our rest stop near Lake Las Vegas area, and then we'll circle around the north hills of Lake Las Vegas before we pick up the Wetlands Park trail, 6 miles of rollercoaster-type hills up and down and around the desert. After that, it's a bit of city-style riding on Gibson Road before we again pick up the Union Pacific trail for our last mile back to the Fiesta. Ride With GPS reports about 1,700 feet of climbing for this ride. The Fiesta is freeway-convenient, right at the end of the 215 where it meets 95. Toilets, water, and a Starbucks are available inside the Fiesta. Park and meet in the rear parking lot partway up the hill on Fiesta Henderson Blvd., near the train tracks. Look for the ALC banner!